Tischendorf had been warming his hands over a fire consuming parchments from the oldest manuscript of the Bible so far discovered. Tischendorf returned eager to save more pages but the monks had already sent the rest back to Russia where it remained until after the Communist Revolution. In 1933, the Russian government, having no use for old copies of the Bible, agreed to sell the Codex Sinaiticus to Great Britain for the princely sum of £100,000. At the time it was one of the highest prices ever paid for a book. Today it would undoubtedly be the most valuable book in the world. Hidden treasure. The term fills us with images of gold and silver. What is your most treasured possession? Your house? Your car? A family heirloom? The Lord has a treasured possession. It is you. This week I counselled a lady struggling to pray. Was God listening? Did he answer prayer? She asked. I explained that prayer is a conversation, a two way communication. First, God speaks and we listen. Then we respond and God acts. If we detach prayer from scripture reading we will soon become discouraged or distracted or our prayers vacuous. I encouraged her to read the Bible every day, and allow God to speak to her, especially through the Psalms, and then read the words of scripture meditatively as fuel for prayer. This evening as we begin our sermon series on prayer, we simply want to learn how to pray. Please turn with me to Ephesians 1 and let us discern who we pray to, why we pray and what we pray for. John Stott observes, In the original Greek these twelve verses constitute a single complex sentence. As Paul dictates, his speech pours out of his mouth in a continuous cascade. He neither pauses for breath, nor punctuates his words with full stops. Commentators have searched for metaphors vivid enough to convey the impact of this opening outburst of adoration. ‘We enter this epistle through a magnificent gateway’. It is ‘a golden chain’ of many links, or ‘a kaleidoscope of dazzling lights and shifting colours’, ‘a snowball tumbling down a hill, picking up volume as it descends’, ‘This rhapsodic adoration is comparable to the overture of an opera which contains the successive melodies that are to follow’. A gateway, a golden chain, a kaleidoscope, a snowball, an operatic overture: all these metaphors in their different ways describe the impression of colour, movement and grandeur which the sentence makes on the reader’s mind. The whole paragraph is a doxology, or indeed a ‘eulogy’, for that is the word Paul uses. He begins by blessing God for blessing us with every conceivable blessing. As we shall see, he makes a deliberate reference to the Trinity. First, God the Father is the source or origin of every blessing which we enjoy. His initiative is set forth plainly, for he is himself the subject of almost every main verb in these verses. It is he who ‘has blessed us’ (verse 3), who ‘chose us’ (verse 4) and ‘destined us … to be his sons’ (verse 5), who ‘freely bestowed on us’ his grace (verse 6, literally ‘graced us with his grace’), indeed ‘lavished’ his grace upon us (verse 8), who also ‘made known to us’ his will and purpose which he ‘set forth in Christ … to unite all things’ (verses 9–10). Further, he ‘accomplishes all things according to the counsel of his will’ (verse 11). Turning from the verbs to the nouns, Paul refers to God’s love and grace, to his will, his purpose and his plan. Thus the whole paragraph is full of God the Father who has set his love and poured his grace upon us, and who is working out his eternal plan. We Pray to God the Father. Secondly, the sphere within which the divine blessing is bestowed and received is the Lord Jesus Christ. In the first fourteen verses of the Ephesian letter Jesus Christ is mentioned either by name or title (‘Christ’, ‘Jesus Christ’, ‘Christ Jesus’, ‘the Lord Jesus Christ’, ‘the Beloved’) or by pronoun or possessive (‘he’, ‘him’, ‘his’) no fewer than fifteen times. And the phrase ‘in Christ’ or ‘in him’ occurs eleven times. Already in the first verse the apostle has described Christians as ‘saints’ and ‘believers’ who are ‘in Christ Jesus’. Now in the rest of the paragraph he draws out the implications of this pregnant expression which denotes a new principle of human solidarity. Formerly we were ‘in Adam’, belonging to the old fallen humanity; now we are ‘in Christ’, belonging to the new redeemed humanity. It is ‘in Christ’ that God has blessed us in time and chosen us in eternity (verses 3–4). It is ‘in the Beloved’ that he has bestowed on us his grace, so that ‘in him’ we have redemption or forgiveness (verses 6–7). Although in this paragraph the Holy Spirit is mentioned by name only in verses 13 and 14, his activity is assumed throughout, and his varied work is described in later chapters. What Paul stresses here is that the blessings God gives us in Christ are spiritual, not material; The indwelling Holy Spirit gives us assurance that we are adopted children of God, the assurance of sins forgiven and the assurance of eternal life. God’s law is written in our hearts by the Holy Spirit. His power enables us to resist temptation and transforms us progressively to become more and more like like Christ. John Stott says the teaching of these verses is extremely important. Christians are Trinitarians. We believe in one God, the Father, the Son and the Holy Spirit. We affirm with gratitude and joy that God has blessed us (eulogēsas, an aorist tense) in Christ with every spiritual blessing. That is, every blessing of the Holy Spirit has been given us by the Father if we are in the Son. No blessing has been withheld from us. Of course we still have to grow into maturity in Christ, and be transformed into his image, and explore the riches of our inheritance in him. Of course, too, God may grant us many deeper and richer experiences of himself on the way. Nevertheless already, if we are in Christ, every spiritual blessing is ours. This is to whom we pray. To God the Father, in the name of the Lord Jesus Christ and in the power of the Holy Spirit. For this reason. What reason? Because we are God’s possession and exist, like the rest of creation, to the praise of his glory. We pray because of all that God in Christ has done for us – forgiveness of sin, the assurance of eternal life, adoption into his family, the indwelling Holy Spirit. For all these reasons, we are motivated to pray for one another. And not only that, we are motivated to pray for those who have yet to know God and experience his love, grace and power. This is who we pray to and why we pray. The apostle now brings together three great truths which he wants us to know, to understand and experience. God’s call, God’s inheritance and God’s power. The ‘hope’ of God’s call, the riches of his glorious inheritance, and ‘the immeasurable greatness’ of his power. The call of God takes us back to the very beginning of our Christian lives. What did God call us for? “that you may know him” – to know God. That is His call – to bring us into a living relationship with himself. All my life I was brought up to believe in God. At university someone introduced me to Him. God’s call was not a random or purposeless or arbitrary thing. He called us to be someone. Nothing less than to be His child – a child of God. What this is the rest of the New Testament tells us. He has called us ‘to be saints’ or ‘called us with a holy calling’, ‘you shall be holy, for I am holy’, we were ‘called to freedom’. We ‘were called in the one body’ to enjoy ‘the peace of Christ’, and must live a life that is ‘worthy of the calling to which we have been called … forbearing one another in love’. At the same time, though we may enjoy peace within the Christian community, we are bound to experience opposition from the unbelieving world. Yet we must not retaliate: ‘For to this (this unjust suffering and this patient endurance) you have been called, because Christ also suffered for you, leaving you an example, that you should follow in his steps.’ Besides, we know that beyond the suffering lies the glory. For God has also called us ‘into his own kingdom and glory’. This is ‘the upward call of God in Christ Jesus’, for the sake of which we press on towards the goal. All this was in God’s mind when he called us. He called us to Christ and holiness, to freedom and peace, to suffering and glory. More simply, it was a call to know, love, obey and serve Christ, enjoy fellowship with him and with each other, and look beyond our present suffering to the glory which will one day be revealed. This is the hope to which he has called you. Paul prays that our eyes may be opened to know it. The apostle’s second prayer to God is that we may know what are the riches of his glorious inheritance in the saints (verse 18b). The Greek could mean either God’s inheritance or ours, that is, either the inheritance he receives or the inheritance he bestows. The parallel passage in Colossians 1:12 strongly suggests ‘God’s inheritance’ refers to what he will give us, for we give thanks to the Father, ‘who has qualified us to share in the inheritance of the saints in light’. If God’s ‘call’ points back to the beginning of our Christian life, God’s ‘inheritance’ points on to its end, to that final inheritance of which the Holy Spirit is the guarantee (verse 14) and which Peter describes as ‘imperishable, undefiled and unfading, kept in heaven for you’. For God’s children are God’s heirs, in fact ‘fellow heirs with Christ’,5 and one day by his grace the inheritance will be ours. Exactly what it will be like is beyond our capacity to imagine. In the Book of Revelation we are given a glimpse of that ‘great multitude which no man could number, from every nation, from all tribes and peoples and tongues, standing before the throne and before the Lamb’. We are to pray for the certainty of God’s call and the glory of God’s inheritance. If God’s ‘call’ looks back to the beginning, and God’s ‘inheritance’ looks on to the end, then surely God’s ‘power’ spans the period in between. It is on this that the apostle concentrates, for only God’s power can fulfil the expectation of his call and bring us safely to the riches of the glory of the final inheritance he will give us in heaven. Paul is convinced that God’s power is sufficient, and he accumulates words to convince us. He writes not only of God’s ‘power’, but also of ‘the energy of the might of his strength’ and he prays that we may know the greatness of it, indeed the immeasurable greatness of it ‘for’ or ‘towards’ us who believe. You want an indication of the power of God? On the 18 May 1980, in the Cascade Range of Washington State, Mount St Helen’s exploded with what is probably the most visible indication of the power of nature that the modern world has ever seen. At 8:32am an explosion ripped 1,300 feet off the top of mountain with the force of ten million tons of TNT. That is the equivalent of 500 Hiroshima’s exploding simultaneously. 500. The heat from that blast reached 300 degrees and travelled at 200 miles an hour, yet mercifully killed only 60 people. But it flattened 3.2 billion feet of trees in a 17 mile wide radius. Yet that is nothing compared to the surpassing greatness of the power of God demonstrated in the resurrection and exaltation of the Lord Jesus Christ (verses 20–23). Paul actually refers to three successive events: first, he raised him from the dead (verse 20a); secondly, he made him sit at his right hand in the heavenly places, far above all others (verses 20b, 21), and has put all things under his feet (verse 22a); and thirdly, he has made him the head over all things for the church, which is his body … (verses 22b, 23). These three belong together. The resurrection and ascension of the Lord Jesus Christ were the decisive demonstration of divine power. There are two powers which we have no control over. Evil and death, We are mortal. We cannot avoid death. We are fallen; we cannot overcome evil. But God in Christ has conquered both, and therefore can rescue us from both. 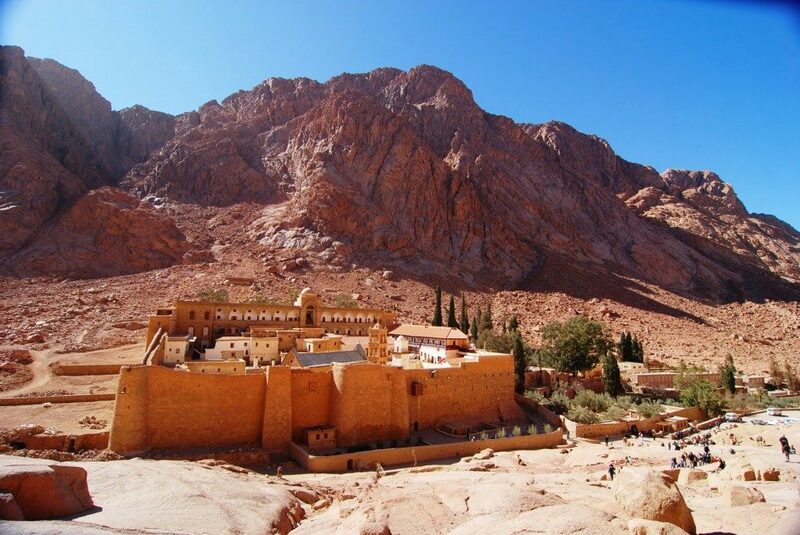 Before we condemn the monks of St Catherine’s Monastery for burning what was then probably the oldest bible manuscript in existence and the most valuable book in the world, just to keep warm, let us reflect on how we treat God’s revelation in scripture. Do we daily, read, mark, learn and inwardly digest its truth as we have discovered afresh tonight? Or does it lie unopened, gathering dust on our shelf? Tonight, from scripture, we have discovered how to pray. Who we pray to, why we pray and what we pray for. We pray to God our Father in the name of our Lord Jesus Christ and in the power, the power of the Holy Spirit. Amen. With grateful thanks to John Stott and Warren Wiersbe for their commentaries on Ephesians, from which much inspiration and content derived. This entry was posted in Bible, Sermons, Theology on May 8, 2016 by Stephen Sizer.